1. Try pairing a photo with your Christmas card design this year. I’m sending this sweet photo of me and my boys captured earlier this year on a visit to Knoxville! 2. 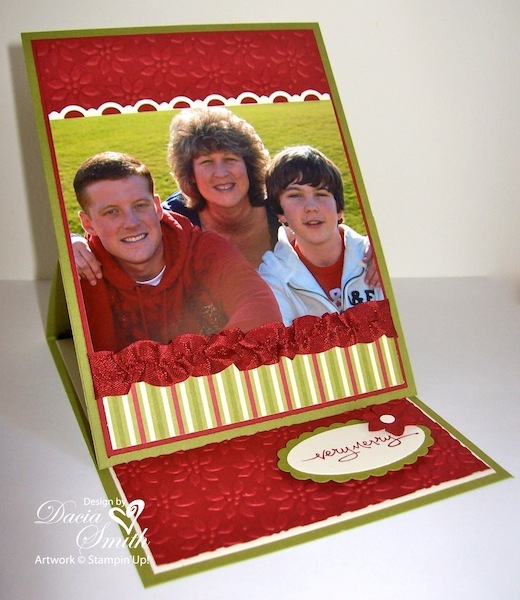 The Petals-a-Plenty Embossing Folder adds loads of holiday cheer. Pull out the design further by creating a poinsettia blossom using the Boho Blossoms Punch. 3. Ribbon is a great finishing touch. Knots create bulk when mailing cards, so I tried a new technique. The ruffle is achieved by gently pulling a horizontal thread in the center of the Cherry Cobbler Seam Binding Ribbon to gather. Apply to your card with Sticky Tape.